Blue light cards initiative signposting victims of drug and alcohol abuse to a brighter future. A pioneering new lifeline service connecting vulnerable people to crisis support services has been launched in Mid and East Antrim. The vital scheme, the first of its kind in Northern Ireland, helps those suffering from drug and alcohol abuse, and their families. Special cards, designed to be carried in wallets and purses, feature emergency numbers which act as central points of contact when specialist help and intervention is needed. The blue light signposting cards have been circulated to frontline workers, including police, firefighters, paramedics and counsellors, and gives them a hotline to potentially lifesaving drug and alcohol support services in Mid and East Antrim. The confidential networks of Start360, Ascert, Voices and Extern are highlighted on the cards, along with their contact numbers and the support they provide. 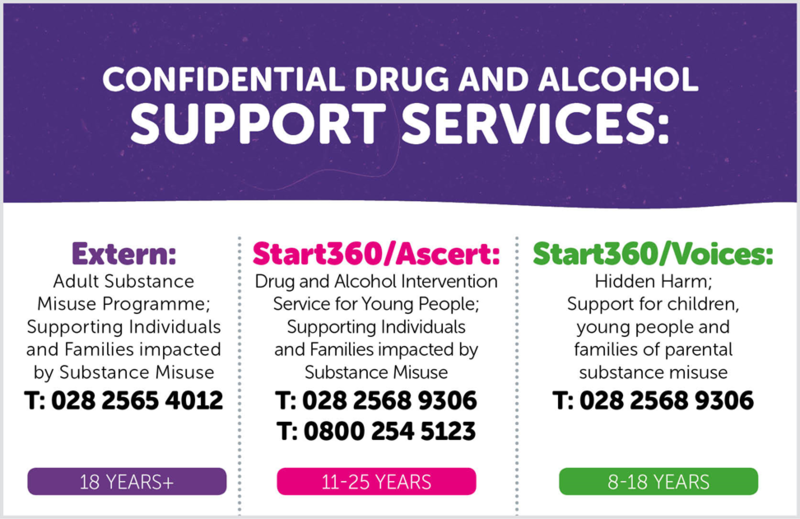 Start360/Ascert provide an intervention service for young people aged from just 11 to 25, whereas the Extern number is available to victims of adult substance abuse. A dedicated Start360/Voices hotline number caters for those suffering from hidden harm. It is aimed at children, young people and families of parental substance abuse. Kathleen Grego, from Ballymena-based charity Start360, said the cards were already proving an invaluable tool in addressing complex issues caused by addiction. She added: “Start360’s Northern Drugs and Alcohol Coordination Team Connections Service was pleased to have played a key role in the organisation, design and launch of the blue light information cards. “Increasing awareness of drug and alcohol support among emergency service staff will benefit their knowledge and the outcomes for service users. Start360 is Northern Ireland’s leading provider of support services to young people, adult offenders and families in the community. It offers a range of services and interventions in the areas of health, justice and employability. The card hotline initiative was developed by the Mid and East Antrim Policing and Community Safety Partnership Drug and Alcohol Steering Group, which identified needs and gaps in service areas across the Borough. The umbrella body includes representatives from the PSNI, Northern Drugs and Alcohol Co-Ordination Team, Northern Ireland Housing Executive, the Regional Service User Network and leading charities and outreach organisations including Start360, Extern, Ascert, Turning Point, the Hope Centre, the Public Initiative for the Prevention of Suicide and Self Harm (PIPS), Preventing Addiction Larne and Addiction NI. All of the organisations involved have a vital role to play in addressing drug and alcohol misuse. The immediate response provided through the cards could prove critical in an emergency if a member of our community is in urgent need of help, and draws on the expertise of statutory, voluntary and community sectors.